Provide comfort for the family of Jill Conrad with a meaningful gesture of sympathy. POTSDAM - Jill Conrad, 63, passed away peacefully on Thursday, March 21, 2019. The daughter of John L. Conrad Jr. and Joan (Carricato) Conrad (both deceased), Jill was born on April 8, 1955 in Harrisburg, Pennsylvania. She was the second of five Conrad children. Jill was a graduate of Shippensburg University (PA) and had retired from an illustrious career as a Licensed Mental Health Counselor for the Saint Regis Mohawk Tribe, Akwesasne, New York. In addition to her parents, Jill was preceded in death by her older brother Jan M. Conrad. She is survived by her three siblings; Jody A. Conrad and husband Donald Seidenstricker of Hanover, Pa, John J. Conrad and wife Mary of Mechanicsville, Va, and Julie (Conrad) Colestock and husband David of Camp Hill, Pa. Jill is also survived by seven wonderful nieces and nephews to whom she provided spiritual support and immense love and inspiration; Lauren and Brynn Seidenstricker, Jason Conrad, Amanda and Sam Franklin and Justina and Luca Colestock. Jill also leaves behind many loving friends who shared her loves of nature, animals, spiritual exploration, and more. Jill was passionate about animals and cared for many cats and dogs during her lifetime. 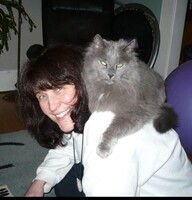 She was a talented Reiki Master and animal communicator and healer. In lieu of flowers, contributions can be made to a local St. Lawrence County Humane Society, Hospice and Palliative Care of St. Lawrence Valley, GardenShare of St. Lawrence County, NY or any local comparable in your area. To send flowers in memory of Jill L. Conrad, please visit our Heartfelt Sympathies Store. An outdoor celebration of life will be held at Higley Flow State Park. Provide comfort for the family of Jill L. Conrad by sending flowers. My deepest condolences to Jill's family. I am saddened to hear of her passing to the spirit world. She was a beautiful person and her compassion showed through her work with our community. Rest in Love, Jill. I am so very sorry to hear of Jill's passing. Her kind and generous spirit was a beacon for us all to smile more, laugh more and for kindness to guide us as it did her everyday. I am so very sad to know she is not of this world anymore. My thoughts and prayers. I’m very saddened by her passing, Jill is such a kind and caring human being and her gentle, compassionate and supportive nature has helped me tremendously. She will not be forgotten. May she continue her journey in peace and love. I am very sorry to hear about your loss. It's not easy to lose someone we dearly love in death. Gods word calls death as an enemy. So our Heavenly Father promises in his word that soon he will end death. "And the last enemy, death, is to be brought to nothing"-1 Corinthians 15:26 And he will resurrect our dear dead loved ones Acts 24:15 May this words help you ro to have some peace and comfort. Although I did not know Jill in person, I spoke with her over the phone when our lovely cat Batman was passing away. She did spiritual work on him, and made it easier for us when it was time for him to go. She seemed to be a caring and loving person when I spoke with her. Rest in peace Jill. My condolences and prayers to your family.